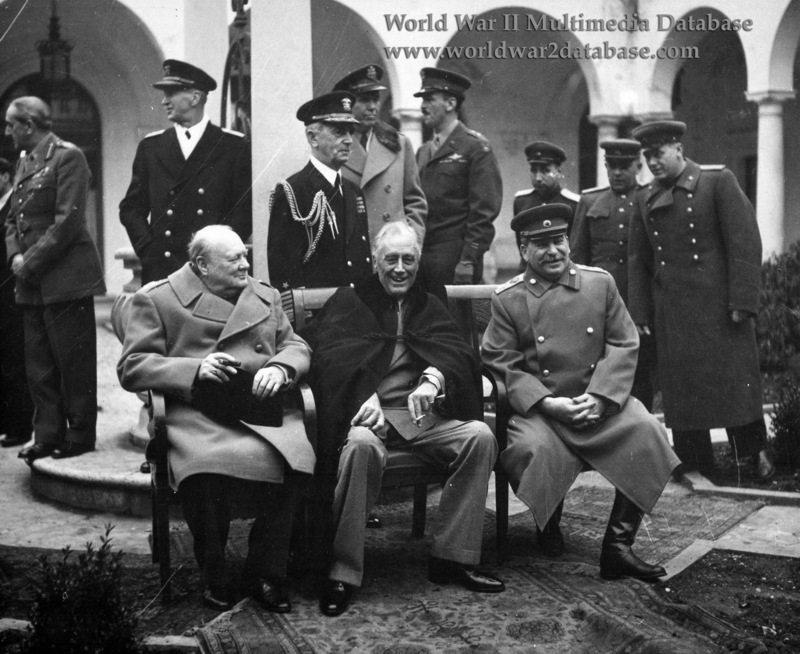 Allied leaders pose in the courtyard of Livadia Palace, Yalta, during the conference. Those seated are (from left to right): Prime Minister Winston Churchill (United Kingdom); President Franklin D. Roosevelt (United States); and Premier Josef Stalin (Soviet Union). US Navy Fleet Admiral William D. Leahy is standing behind Roosevelt. Leahy was Aide to President Franklin D. Roosevelt and Senior Member of the Joint Chiefs of Staff. Perhaps the most controversial of the three major conferences during World War II, Roosevelt secured Soviet participation in the United Nations by guaranteeing veto power; the Soviets were able to hold their territorial gains in Eastern Europe; and the United Kingdom was able to force elections in Poland in 1947. By then the elections were rigged in favor of Communist candidates, and many conservatives see the roots of the Cold War in the Conference. Before the atomic bomb, before the invasion of Okinawa (the worst combat of the Pacific War) Roosevelt was facing a massive and costly invasion of Japan and wanted to secure the Soviet Union's participation. Stalin faced losses of 25 million soldiers and civilians, and wanted the next war to be fought on someone else's soil. The outcome of Yalta, while it was not the step towards world peace it was portrayed at the time, must be judged by the extreme and desperate circumstances that characterized the first half of 1945 - the worst fighting in all of human history.